Will the MARS damage the belt? No. The MARS is custom designed to operate safely on all belt widths and speeds. The edge of the MARS plow blade is padded with industrial grade rubber. In addition, the MARS flattening/slider bed, which replaces the idler units and continuously supports the belt underneath the MARS, is equipped with ultra high molecular weight (UHMW). How does the MARS work? The MARS mounts on the conveyor (at practically any location) and works with a metal detector. When the detector senses tramp metal in the material on the belt, it sends a signal to the MARS. 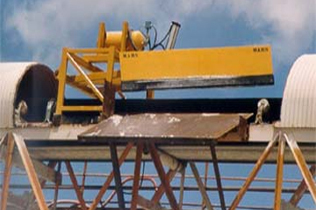 The MARS processes the signal and automatically lowers an angled plow blade to flatten the belt and divert the metal off the conveyor. Once the metal is discharged, the MARS raises the plow blade to allow for normal material flow. The entire process takes only seconds. Conveyor belt NEVER STOPS. Will the MARS work on my conveyor? The MARS is custom designed to fit all belt widths and speeds conveying any type of bulk material. The MARS is effective in many industries, including crushed stone, sand and gravel, coal, slag, power plant, pulp and paper, chemicals, ore mining, placer operations, food products and many others. Will the MARS remove non-ferrous metal? Because the MARS works in conjunction with a metal detector, it can remove non-ferrous and ferrous metals. This is why the MARS offers the total solution to tramp metal problems (unlike the use of magnets or metal detectors alone). Will the MARS remove clusters of tramp metal? The MARS automatically processes the signals it receives from the metal detector. If a second piece of metal is detected close to the first piece or if a cluster of tramp metal is detected, the MARS controls will determine how long the blade must remain down in order to discharge ALL the metal from the belt. How much material is discharged with the metal? Because the MARS cycle takes only a few seconds, a minimum amount of material is discharged. For example, on a belt running 1,000 tons per hour, only about a half a ton of material is discharged per cycle. Is the MARS difficult to install, operate or maintain? No. The MARS requires minimal site preparation and can be installed in about six hours. The MARS is fully automatic and is practically maintenance free! How do I select an appropriate location for the MARS? In total, the MARS takes up about twelve linear feet of the conveyor. Ideally, the MARS should discharge metal on the opposite side of the conveyor from the catwalk. The area below the conveyor where the material will be discharged should be appropriate (that is, away from roadways, safe for personnel and equipment, etc.). The distance between the MARS and the metal detector is dependent on the belt speed. For warning horn activators from a range of 10 feet to 90 feet distance has been used. No. The MARS is a very cost effective solution. It typically pays for itself in less than a year! See the Benefits & Savings page for more information. Do I have to buy a new metal detector? No. The MARS will interface with any make and model of metal detector. Therefore, you are free to use your existing metal detector or purchase a new metal detector from another source. However, you can also purchase a new Scitronics dual coil tramp metal detection system from AFOR Systems as an option with the MARS. See our Specificatons page for more information. What is the lead-time on the MARS? Lead-time for delivery is approximately ten weeks from the time AFOR Systems receives your purchase order and deposit (i.e. 30% down payment). How can I get more information on the MARS? Contact AFOR Systems and we will be glad to send you an information package on the MARS. How do I request a quote and place an order? Feel free to use our request for quote form, or contact AFOR Systems and one of our sales professionals will be glad to answer all of your questions and provide you with a no-obligation quote. To place an order, AFOR will need a purchase order and a deposit (i.e. 30% down payment). We design equipment for special applications and needs. Please ask us.